A typical view of our new surroundings! Hi, it’s us again! Several people have asked ‘what happened next?’ So now seems a good time to bring you all up to date with developments in the two-and-a-half months since we got back to the UK. First stop was my mother’s house in Dorset, we spent 10 days there and really enjoyed catching up with family. Next stop was Cornwall to start house hunting, Plan A was to rent somewhere for a few months while we looked for a house to buy. Some of you will already know that our friend Yvette is moving to Cornwall with us, in our absence she had taken it upon herself to rent somewhere as Cornwall Base Camp. 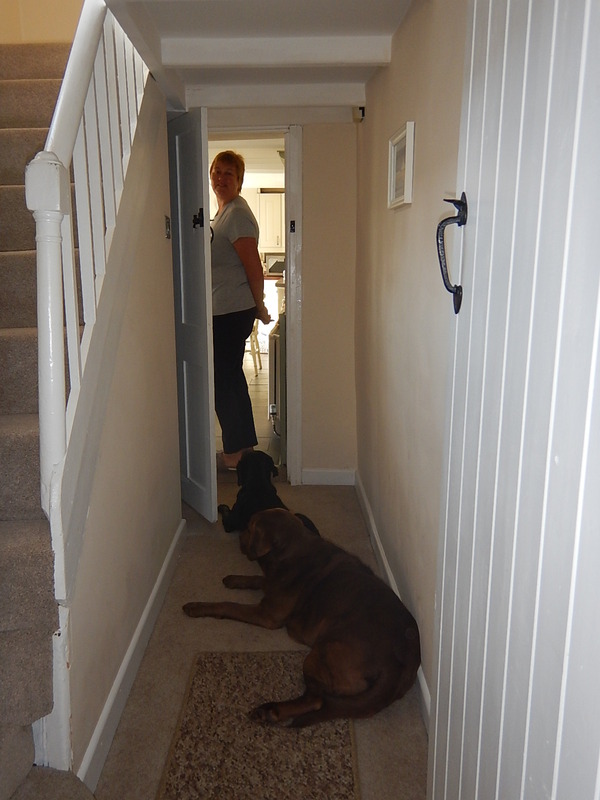 Yvette has two Labradors and none of us had anticipated how difficult it would be to rent a house which permitted dogs. Despite two trips to Cornwall in January, and seeing homelessness looming on the horizon Yvette was unable to find anywhere to rent, so, Plan B, rent a short-term holiday let to give us somewhere to live while we sorted ourselves out. Kim, Pheobe and Silk settling in. 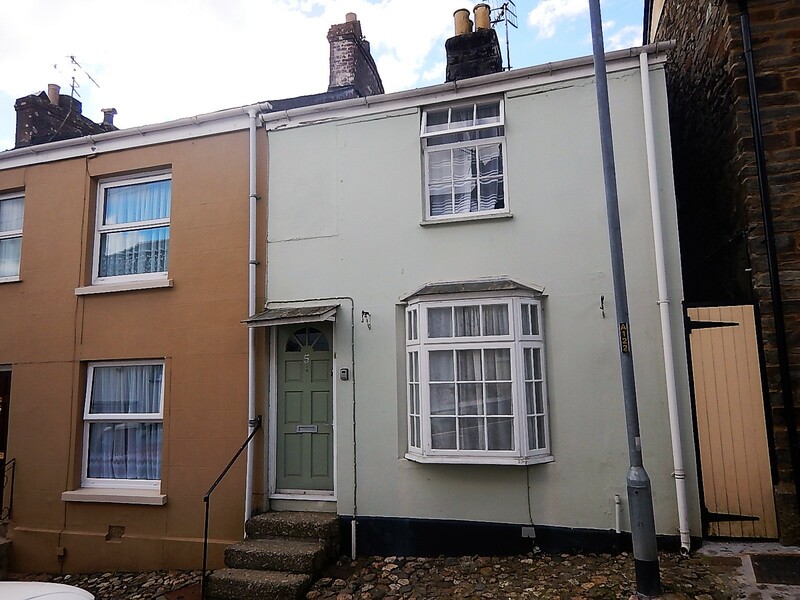 Yvette booked a terraced cottage in Losthwithiel for a month and a farm cottage near Porthcurno for a month. This turned out to be an excellent plan as it gave us a chance to experience living in two different parts of the county. Lostwithiel is an historic town in south east Cornwall. We enjoyed being in the heart of the village and walking in the surrounding countryside; even if the café at the Duchy Garden Centre across the valley let us down by running out of scones on a Sunday afternoon after we had walked up hill and down dale to get there for a cream tea. 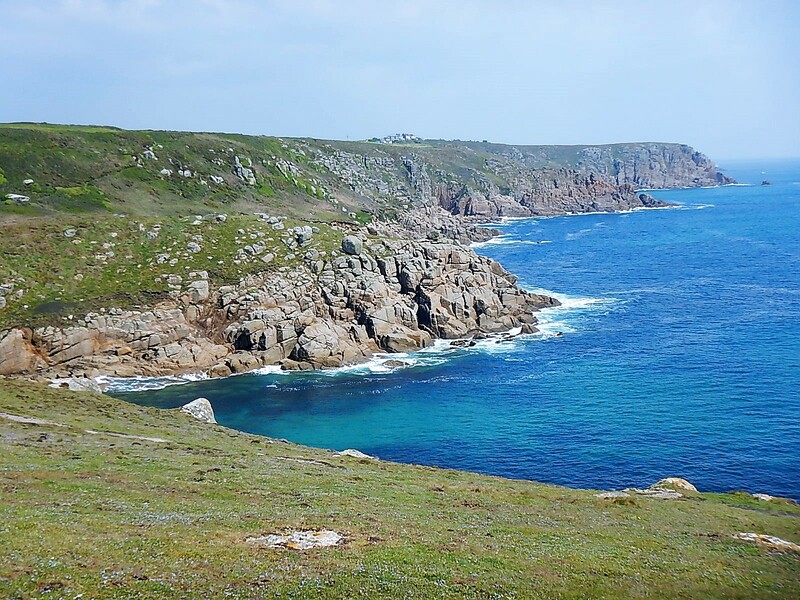 The cottage near Porthcurno was much more remote, we were just a mile and a half from Lands End and had easy access across the fields to the South West Coastal Path. We all fell in love with the far west, the landscape is breath-taking and there is something about the light which just raises your spirits. We hadn’t planned to move so far west but having spent time there and got used to the roads and local towns we decided to refocus our house search in that area. Meanwhile we had managed to rent Little Siverga, a barn conversion just outside of Helston. We have rented it for six months and Yvette has moved her furniture in, it is cosy and comfortable and will do nicely until we find a permanent home. In another significant development marking a new era in our lives we have swapped our SAAB convertible for something more Cornwall friendly (no, not a horse and cart as one friend suggested). We are now the proud owners of a Subaru Forrester, a chunky 4×4 well suited to road conditions down here. All change!! We have seen lots of houses since we got down here, we have a very specific brief needing somewhere for us and somewhere for Yvette and her mother who will be moving down too. Several places we saw were farmhouses with barns either already converted or requiring conversion. We have got very good at assessing the potential of different places spotting walls that could be moved and outbuildings that could be incorporated. Some places were too small, some were too remote some needed too much work but every one we visited helped us refine our requirements and learn what we were and weren’t prepared to take on. At one point we thought we had found the perfect spot, a farmhouse with a triple stone barn garage with an apartment above it and a separate one bedroom cottage. The location was idyllic, a private valley with a river running through it and just 15 minutes from the County Town of Truro. We even arranged a second viewing with an architect in tow to advise us on the implications of converting the garage in to a two-story dwelling for Yvette. Everything was going well until the owner (he’d lived there for 50 years) told us proudly that he had built the garage himself, and that when he’d shown people his plans everyone had said it would never stand up! Suddenly the prospect of converting the barn seemed like a much riskier project than we had anticipated. Back to the search. Mark and I went back to Haddenham for a long weekend for a friend’s birthday party and to catch up with old friends and neighbours. We had a lovely time but were excited to get back to Cornwall and resume our search. While we were away Yvette had found details of a house near St Just, the most westerly village in Cornwall; it was well over budget but, on paper, seemed such a good fit with our brief we decided to check it out. We arrived on a rainy, windy Saturday morning and figured if we liked it in those conditions we would definitely like it in sunshine. As we toured the property with the agent we ticked off one feature on our wish list after another. 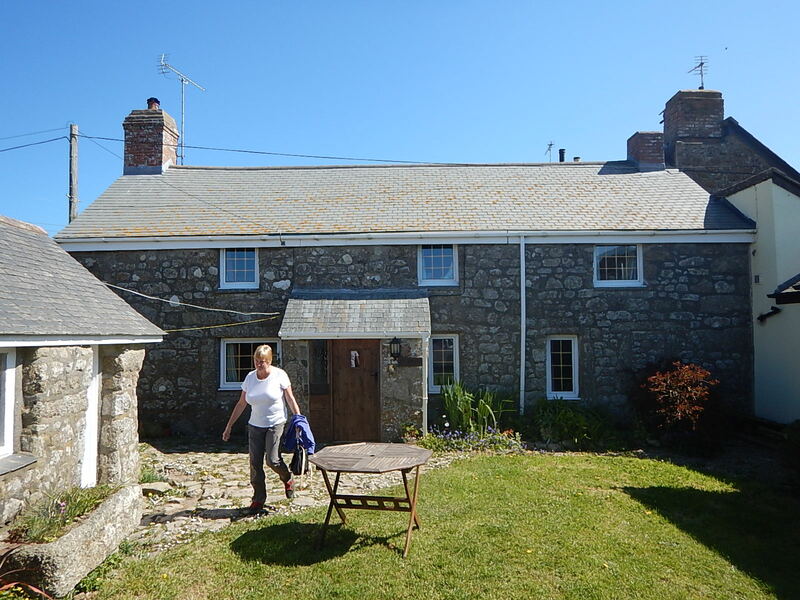 Four-bedroom stone farm house, plenty of living space, big garden, sea views, beautiful converted barn, ground floor accommodation for Yvette’s mum, good road access (no scary single-track lanes). Even things that weren’t on the list got ticks, adjoining fields, vegetable garden with poly tunnel, wind turbine and solar panels providing electricity and generating an income. It just felt right, we kept looking at each other wondering whether this was it. Mark and I went back for a second viewing a week later, while Yvette was back in Shropshire, we came away even more convinced that this could be the house we were looking for. We had a chance to speak to the owners and were delighted to discover that they were willing to sell some of the 4 acres of farmland separately and drop the price accordingly. On Yvette’s return, and after some to-ing and fro-ing with the agents to identify which fields we wanted to keep and which could be sold we decided to make an offer. The first offer was rejected but after a bit more negotiation our second offer was accepted!! We still have to get a building survey done and work through all the contractual stuff but all being well we will be moving in to the farm in September/October. We have already had some friends to visit us in Cornwall and we are looking forward to many more of you coming down to stay once we have settled in to our new home, we are quite sure you will love this area as much as we do. We will write again when we have more news, in the meantime please keep your fingers crossed that everything goes smoothly with the house purchase. We are in Falmouth next week ( July 24th to 27th). Just wonder if you are around and anywhere near.